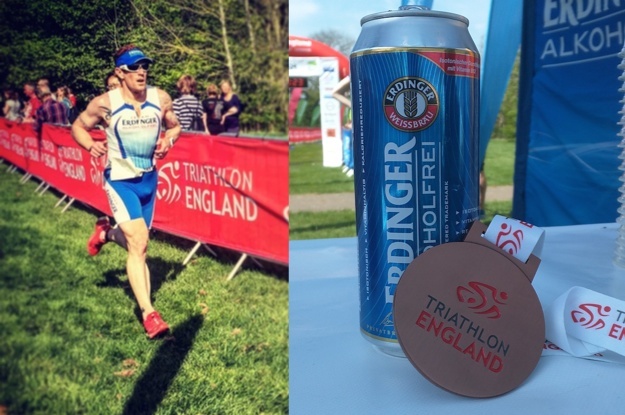 It’s Wednesday and I’ve just agreed to help out pouring and serving samples of ERDINGER Alkoholfrei at the upcoming NiceTri Events St. Neots Triathlon which has been moved to Grafham due to the usual venue being waterlogged. 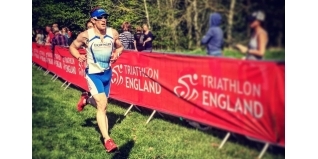 With the Outlaw Half just a few weeks away I had been looking at events to get some racing miles in the legs and get a gauge as to my current form - this presented the solution I needed with a big enough gap between events that I could train through and continue building towards the Outlaw. 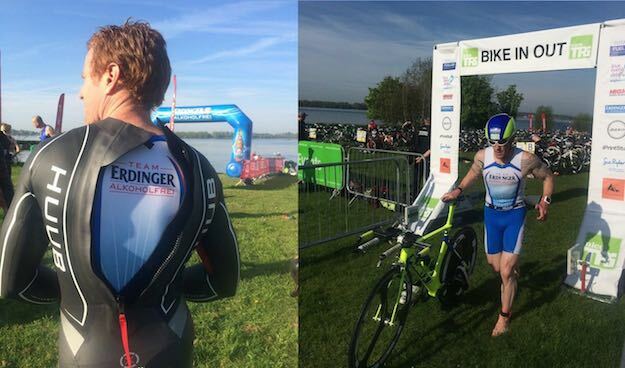 So that was it, my first race of the year would be at Grafham Water, not quite what I had in mind but nothing increases motivation more than pinning on a number. It was only on the Friday that I thought I should have a quick read of the race brief and realised that this event was also the Traithlon Engalnd National Standard Distance Championships and 2016 ITU Standard Distance Triathlon Qualifier, so I knew there would be some quality athletes racing, but despite this I went into the race feeling very relaxed with absolutely no expectation to produce a result. Fast forward to race morning and I registered and racked; being a late entry meant I was racking close to the swim in area of transition which was in the exact opposite corner of bike out, but I chose a spot and walked my route through transition and back to ensure I wasn’t going to be running about looking for my bike or trainers later on. After the short but detailed race brief the first of the four waves was underway. Five minutes later I was treading water in the clear Grafham Water, waiting for the off. I had chosen the far right of the start line to get a straight run at the first turn buoy. The claxon sounded and we were unleashed onto the 1500m swim course. After the initial flat out sprint I found myself swimming alone roughly in line with a small group that had formed over to my left. As we approached the turn buoy I came together with the group and settled in for the remainder of the swim, my new HUUB Archimedes 2 performing brilliantly. After 21 minutes I was running up to transition, and a few minutes later I was mounting my bike and heading out onto the 40km bike course. Having raced the Grafman Middle last year I was familiar with the course and was more than aware that the lack of any climbs made it hard to get away. I soon found my rhythm and was overtaking athletes from the first wave; rather annoyingly about four miles into the route a motorhome pulled onto the course and slowed to about 20mph - I was stuck, obviously I didn’t want to endanger either myself or any other competitors by attempting to overtake - so frustratingly, I rode behind allowing athletes to catch up from behind. Whenever there was an incline, I pushed hard up the climb and over the top, but as with the Grafman last year the chasing pace line behind soon reeled me in. My only game plan became to keep hitting the short rolling climbs tempting the group to come with me and maybe taking some of the run out of their legs. After a reasonably quick T2 I it was now out onto the 10km run course. I soon overtook the athletes ahead with the exception of Duncan Shea-Simmonds who was running strongly and at pretty much the exact same pace as me. We were both overtaking athletes ahead and slowly but surely i was closing in on him. By the final turnaround point I was only a few seconds behind and was feeling good. With a mile to go I was on his shoulder but on the final little uphill Duncan gave a strong effort which I couldn’t respond to and the gap opened again - whilst Duncan is in a different age group, he really pushed me to the line and I’d like to think him knowing I was there helped to spur him on to a fantastic second place in his age group. For me, I crossed the line in 18th overall and third in the 35-39 age group, a result I wasn’t expecting but am really happy with. I now have another couple of weeks before winding down and attempting my defence of the Outlaw Half title.